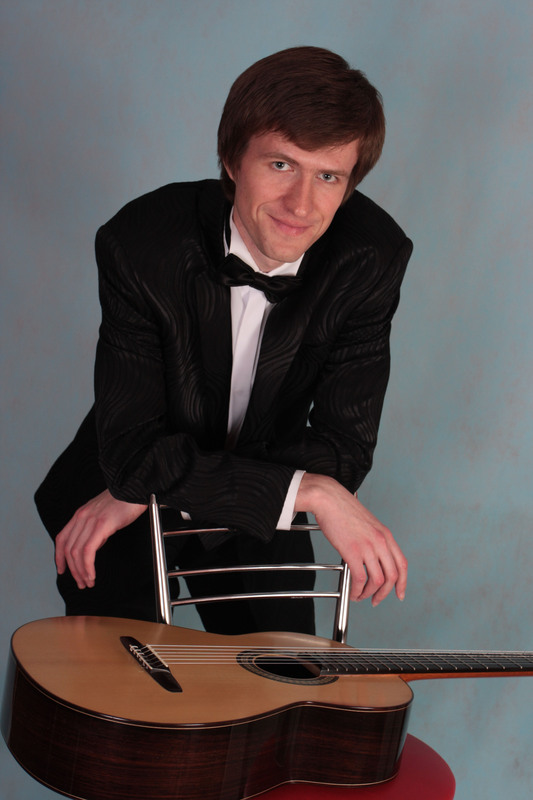 Pavel Kukhta - one of the brightest classical guitarists in Europe. Pavel Kukhta is one of the brightest guitarists in Europe. He was born in Grodno, where he got his first musical education at the music college with prof. V. Zakharov. Having graduated from Belarusian State Academy of Music in Minsk he entered the master course under prof. E. Gridiushko. As a student he received grants from the Ministry of Culture of the Republic of Belarus and from the Special Fund of the President of the Republic of Belarus. At present Pavel Kukhta is a soloist of the Belarusian State Philharmonic Society and he teaches at the Belarusian State Academy of Music. He also took part in master classes of such famous guitar players as: P.Romero, D.Russell, H.Keppel, O.Ghiglia, C.Marchione and others. The year 2015 is marked by a great event in Pavel’s career: he won one of the most prestigious international guitar competitions in Heinsberg (Germany). It gave him an opportunity to play some concerts in Europe, Asia and the USA. He also recorded his solo CD at Naxos – the world's leading classical music label from Canada. This is the second CD of the musician. The first one was recorded in Nordhorn (Germany) at P&C Samsong Productions 2012. Pavel's CD, recorded on "Naxos" label entered top-8 best discs among 83 classical music CDs, recorded in 2016, according to the American Record Guide Critics' Choice. As a special guest, member of the jury and with master-classes Pavel Kukhta took part in different festivals, which were held in different countries, such as: Austria, Belarus, Israel, Hungary, Lithuania, Poland, Russia, the Slovak Republic. He also played concerts at many prestigious concerts halls, such as: Moscow International House of Music (Moscow, Russia), the Belarusian State Philharmonic Society (Minsk, Belarus), the National Philharmonic of Ukraine (Kiev, Ukraine), and others. Pavel takes active part in radio and TV programmes in Belarus, Hungary, Spain, Poland and Russia and is involved into teaching activity. Besides, Pavel cooperates with such collectives as: the Chamber ensemble “Ensemble Perosi” (Turin, Italy), “Valencia Orchestra” (Valencia, Spain), “Orquesta Lírica De Castelló” (Castellon, Spain), Orquesta de la Universidad de Granada – OUGR - (Granada, Spain), “Arco” (Moscow, Russia), the National Symphony Orchestra of Ukraine (Kiev, Ukraine), the Zielona Góra Philharmonic Orchestra (Zielona Góra, Poland), the Ensemble of soloists «Classic-Avantgarde» (Minsk, Belarus) and others. Pavel collaborates with a famous Belarusian composer Galina Gorelova. The author dedicated to the guitar player the Prelude and Fugue, whose premiere performance took place in 2016. This composition was also recorded to Pavel’s solo CD by Naxos. Besides, a famous Spanish composer Eduardo Morales-Caso dedicated to Pavel his composition «Intangible Maelstrom» in 2016. In 2013 on the stage of the Big Hall of the Belarusian State Philharmonic Society there took place a concert, where Pavel performed together with a legendary guitar player and composer Roland Dyens. All the evening the listeners had an opportunity to hear the music, written by the author, which included original compositions, jazz arrangements and improvisations. Some time later the composer dedicated to Pavel one of his new compositions, called «Blue Montuno». Pavel Kukhta has been a Savarez artist from 2017.